For those of you that have read my other canning posts or watched my canning videos on our YouTube channel you are familiar with SimplyCanning.com and my dear friend Sharon Peterson. 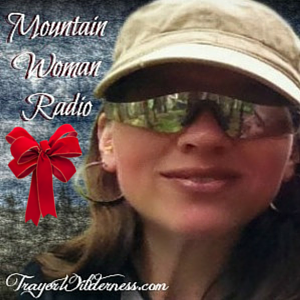 I not only have the wonderful opportunity to communicate with her online, but I had the privilege to meet up with her here in Idaho when her husband came our way on a business trip. 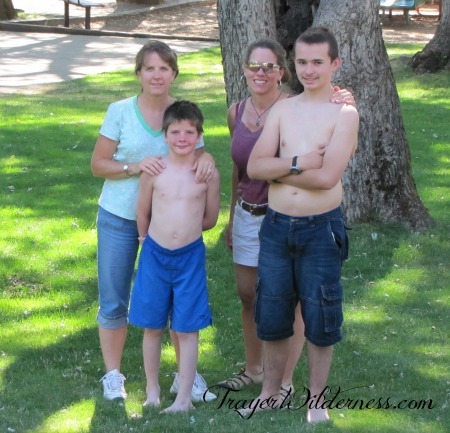 We spent the day in a park here in Idaho with our boys and enjoyed good conversation and we really got a wonderful chance to get to know each other. Since then we keep in touch regularly and help each other out. She is a sweetheart and I am blessed to know her as a person and I have also been blessed with her books. 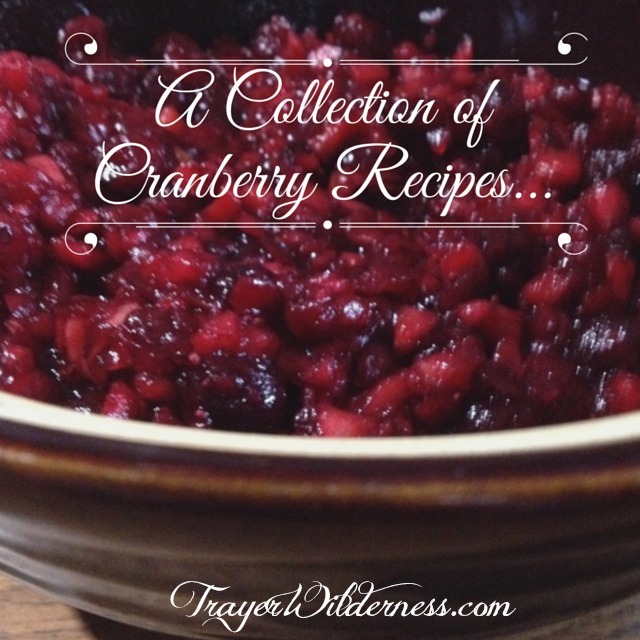 Each of her books are utilized in my kitchen and in my home. She is a wonderful author with a great writing style and is a fantastic educator on what she loves best! Sharon and I are very much alike in that our passion for canning is to feed our families of big eaters, healthy and nutritious food all winter long, most of which comes from our own gardens. 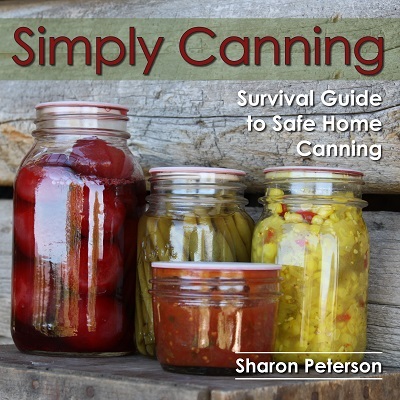 I can not rave enough about this book and recommend the book as well as Sharon and her website to everyone I talk to about canning and preserving. 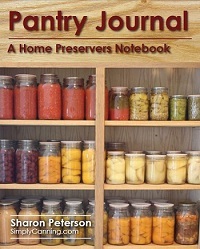 She is the go to for everything canning and there is a reason there are 256,000 people on Facebook alone following her. 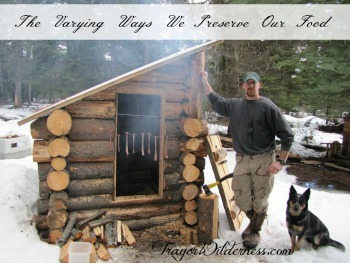 Here in the wilderness, food preservation is on the top of the list. As most of you know, we live off-grid with 100% solar in the northern Idaho wilderness. We utilize age old techniques and traditions in all we do and preserving our food for our pantry and canning shelves is no different. We do own a small propane freezer, but because my men are very BIG eaters I need to have my shelves heavily stocked for winter. Did I mention that my men are BIG eaters (ha)? We make absolutely EVERYTHING from scratch here on our homestead in an effort to be more self sufficient, to accommodate the Mountain Boy’s gluten free and dairy free diet and to provide us with a much healthier lifestyle and diet. Another reason we use varying forms of food preservation is so we have the skills, so we can practice them and have the knowledge under our belts in the event that modern forms are no longer usable. Not only do we make everything from scratch, but we forage a lot of our ingredients such as berries, teas, etc and we grow as much as we possibly can. We also raise chickens for fresh eggs, rabbits for meat, goats for milk and we harvest all our meats from the wild each hunting season. 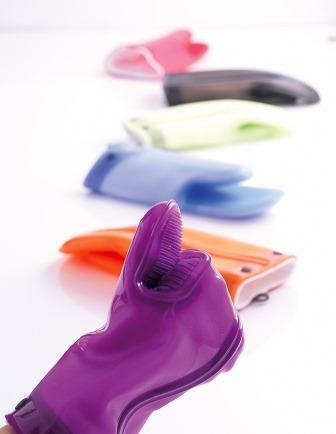 Knowing how to dry and dehydrate things is important and thinking out of the box to do so is also important. You do not need fancy modern day gadgets to always get the job done. These are not new skills and there are many ways to do this. I like drying my teas, hung upside down on my wash line to dry. To keep them dust free and to allow the leaves to fall into a save place I secure them with either a brown paper bag or cheese cloth around them which will still allow air around them for proper drying. This is a great way to save seeds from your garden as well when your plants have gone to flower. Additionally, you can use your vehicle for a form of a Sun Oven for both cooking, rising your breads and dehydrating things as well. I just dehydrated celery and blueberries in my Sun Oven by placing parchment paper on drying racks (you could even use cooling racks for cookies – anything that will allow air to circulate around whatever you are trying to dry). We have also created our own solar cooking devices to which we will be sharing the how-to very soon. You can use the heat from your wood stove in the winter to dehydrate things as well as an outdoor wood fire or smokehouse. There are some GREAT dehydrators on the market, but we have not had the additional finances to purchase one such as the Excalibur. We are very frugal and have learned to utilize what we have and use a little ingenuity to create things for ourselves when finances won’t permit us to have the modern day conveniences. We feel this is a great mindset and really gets you thinking out of the box. One of the great things about drying and dehydrating foods is that you can place your dried materials in canning jars, place lids and rings on them and place them in an oven on low heat just enough to heat the seals. Remove the jars and your jars will now seal which will give them a much longer shelf life. I grew up with a family that canned EVERYTHING and for this I feel very blessed. Being able to harvest your bounty from your garden, cleaning and slicing, processing your fruits and vegetables in your water bath canner or in your pressure canner is such an amazing process, one that I hold near and dear and find to be very very rewarding. Every time I can I think of my mother and my grandparents. Those times in my life helping my family process our summer bounty created amazing memories for me and now I do the same thing with my family and mainly my son. Who would have thought that something like canning could provide you with some major quality time with your children, right? In the past, this is how families and communities came together and I am blessed to have some of the most amazing conversations with my son while we spend the entire day processing our food. I do not have to drag him to the project, he comes willingly and with much excitement of his own. He enjoys chopping and honestly I think he gets as much out of it as I do when you pull a jar from the shelf during the winter months and know that it was the labor of your love that put that food on our shelves. These are good skills and traditions to instill in our children. This will also enable them to know how to preserve food for their families as well. 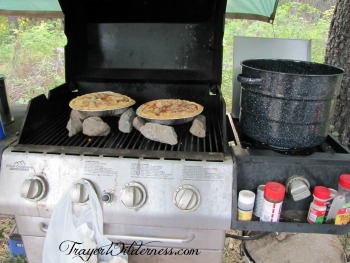 It is possible to can your food on your modern day stove top, on an outdoor propane burner and also over a wood fire. 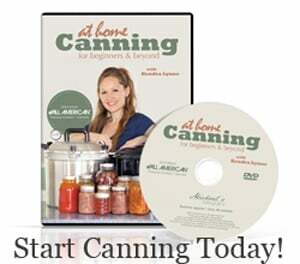 If you are new to canning be sure to start in your kitchen and below you will find several of our canning videos and some of the items I feel are essential. 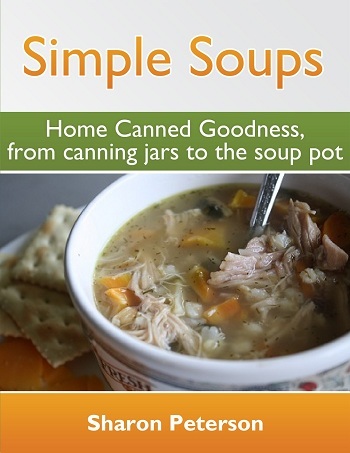 I also highly recommend you check out Sharon Peterson at http://SimpleCanning.com. Her website is an amazing resource and so are her books. 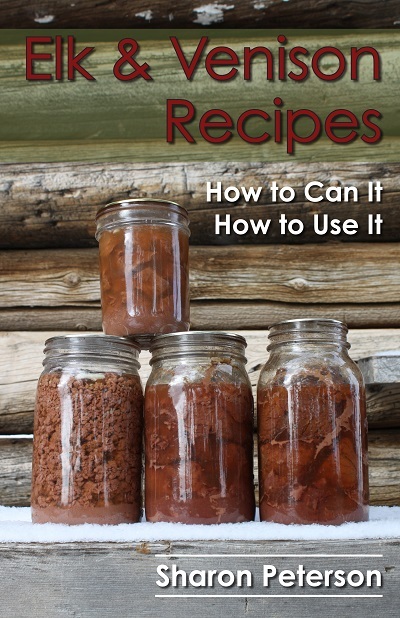 Kendra Lynne also offers a fantastic canning video title At Home Canning for Beginners and Beyond for those of you that prefer to learn via video, this is a great resource. I also enjoy Diane at http://CanningDiva.com and I LOVE her silicon canning mitts which are really comfortable to use and easy to work with. 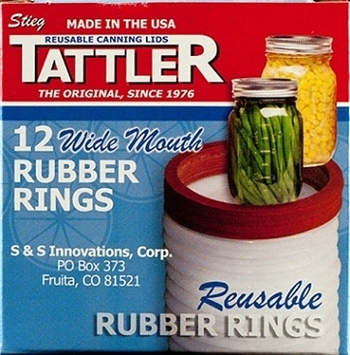 I also use Re-Usable Tattler Seals which are a great tool and will allow me to can moving forward no matter what. The ability to continue reusing these seals allows my canning ventures to be endless. 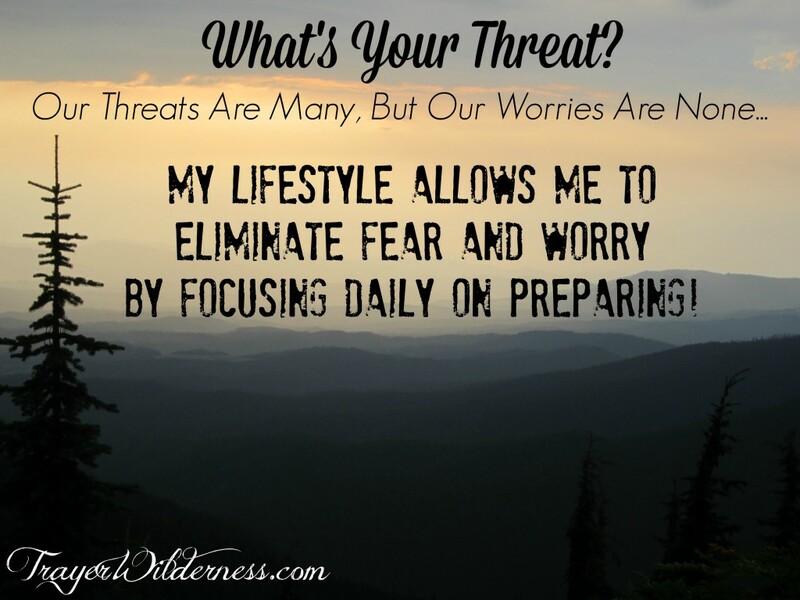 Now I know that I mentioned being frugal and not spending more than necessary, but when I am passionate about a product or feel it is absolutely necessary or worthy of your time, I will be sure to share it with you. Fermenting and pickling is something else I believe my family holds near and dear for our sauerkraut, dill pickles and our lime pickles. My men LOVE pickles and they get used on and in EVERYTHING. Our Friday night pizza is not complete without a jar of lime pickles being added to the many pizzas. Not only are they tasty, but fermented and pickled items are good for your digestive system and useful for many things. Vinegar is a HUGE staple in our home. Be sure to subscribe to our channel because there will be a LOT more videos on the subject and also on salting, curing, jerking and smoking as well as many others. Now before we even dive into this topic, let me share a bit with you. We raise or harvest our own meats and do all of our own butchering. We utilize everything we possibly can from the animals and render down the fat for lard and even brain tan and smoke the hides for shoes and clothing. We enjoy doing all these things as a family and have taught our son the processes so he too can utilize these skills with his family. Being able to get hormone and GMO free meats is very important to us and there is nothing better than a deer or elk roast on the wood stove in the winter months. We utilize our wood stove for all our cooking and you will not find tastier game meat than of that cooked on the wood stove all day long simmering on a lower heat. A little side note as well. Last year the Mountain Man shot his moose here in Idaho and it filled our freezer so when we each shot our buck and our cousin and my father-in-law shot his we needed a place for 5 deer. We canned 113 quarts of venison burger which was out of this world and extremely handy for making meals all year long. Now, we grew up with families that smoked their own meats. We were in an area that butcher shops were every where and good meats were readily available. We were spoiled because when we moved to Idaho that was not the case. In 4 years, I have found one butcher shop and it is a great distance from us. We love our fresh, home raised, and smoked meats. 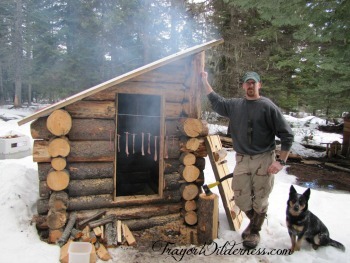 As soon as we finished building our home, we quickly went to work building our smoke house. This is a fantastic way to preserve meats if refrigeration or freezing is no longer an option. Knowing how to smoke your meats and traditionally cure your meats is a skill that appeared to be getting lost. We couldn’t live with that… 🙂 So we used recipes and brines from our grandparents and great grandparents to make bacon, hams, etc. Jerking your meat is also another great way to preserve meat and provide your family with healthy snacks. We have sadly been doing our smoking, salting, and curing on the fly since we are here, but over the winter months this year we will be heavily educating on this so please do stay tuned for our videos and posts. We will also take you through the steps with us on brain tanning the hides. We started all this as a hobby and had several YouTube channels to which we merged this year into one. So if you are liking our videos and would like to subscribe you can do so here. Thank you for joining me today and I hope you have gotten something from this post. Below you will find additional posts on how some of my friends are preserving their food. Leave me comment below – What is your favorite form of food preservation? I would LOVE to know…. Join us as we share different reasons and methods of how we preserve food to create a long-term storage plan for our families. Click on each link to be taken to a new blog with helpful information and tips. Melissa K Norris – Re-Usable Canning Tattler Lids-Do They Really Work?